I purchased some of your Silica Anti Ageing Gel and was very pleased with it. How Can Remedy Box - Skin Care Anti Ageing Gel Help? Skin Care Anti Ageing Gel is a concentrated formula of organic silica and plant extracts that supplement the ageing skin’s natural requirement. It provides the building blocks for healthy, firm and radiant skin. It activates the natural rejuvenation while moisturising and revitalising the cells in the face and body. The wrinkles are slowly smoothed away and the formation of new wrinkles is delayed. The skin is thus rendered smoother, firmer and has a higher moisture content. As it is organic, it helps the oxygenation process at a cellular level. Its restructuring action helps to gently reduce wrinkles, and under-eye puffiness. By improving skin’s elasticity, it reduces stretch marks. Skin Care Anti Ageing Gel can be applied on the face and for under eye bags. It provides gradual, long lasting natural benefits. Gently apply a small amount of gel twice daily under the eyes. For a radiant look apply the gel on the face as directed. It leaves the skin radiating natural delicate aroma of Geranium Rosa and Honeysuckle plant essential oils. The Gel can be applied on the face before putting on the make-up. It thus creates a thin film on the skin blocking in moisture and providing protection from environmental pollution. It is hypoallergenic, non oily, non greasy and ultra penetrative. What causes wrinkles and lines? The scientific research done by Carlisle in USA, and Loeper & Odier in France has shown that silica is indispensable in the synthesis of collagen and elastin fibres in connective tissues. Any deficiency or low level of silica in these tissues leads to a loss in their elasticity and in their integrity. It is also known that the quantity of silica in the human body decreases over 30 years of age. This deficit causes the skin to dry out and wrinkles and lines to appear. Essential Body Functions of Silica Historically the cutaneous effects of silicon were first observed in the thermal springs. The benefits of these thermal muddy waters had a reputation of dermatological marvels. The application of the thermal mud has besides its benefits on articulations, the characteristics of improving and toning the skin. That is due to the fact that the thermal mud contains silicon (impressive 60+%). This nature’s chemical laboratory, where the colloidal reaction between the spring water (infused with various gases and elements) and the silicon in the mud cannot be duplicated elsewhere other than the place where it originates. The elements oxygen and silicon together make up silica. Oxygen is present in the body in large quantities. In contrast the second most abundant element on earth after oxygen, silicon, is present in the body only as a trace element amounting no more than perhaps 15 mcgms per 100ml of body fluid. Prof. E Carlisle UCLA, Loeper & Odier France and K Schwartz, have shown silica to be involved in metabolic as well as structural processes human beings. Carlisle in her studies in 1972 has shown silica to be an essential trace element. (In order to qualify for the appellation of “essential” an element must show a reproducible effect on a vital process in the living body that cannot occur without the element i.e. silica in this case. Such reproducible studies performed “in vitro” and/or “in vivo” verify that silica is an essential element. Young person’s skin fabric contains maximum amount of silica. But after thirty years of age it starts to deplete. Silica in an unassisted form is rather insoluble. This explains why there is such a small trace quantity in the body and why silica only in organic form is fully absorbable. The skin has in its conjunctive fabric strong contents of fibroblasts and extra cellular matrix (MEC) = collagenous, elastin and different GlycosAminoGlycanes (GAG). In an individual, the synthesis of collagen is very dependant on silica. There is also a very strong relation with the elastin contents as its synthesis is also dependant on silica. It is the elastin which, as its name indicates, gives elasticity to skin (and the arteries). The loss of silica and its molecular properties is the fundamental to most obvious signs of cutaneous ageing (as is arterial ageing). The hydration of skin depends on the contents in GAG macromolecules. Reduction in arterial thickness due to the loss of silica showed signs of hydration. This process is observed before the appearance of wrinkles. With the introduction of organic silica molecule (specific tri Si family) into the skin, the arterial thickness improves which leads to hydration. As the connective fabric elasticity is rejuvenated the wrinkles visibly become smoother and the skin firm and hence more radiant. 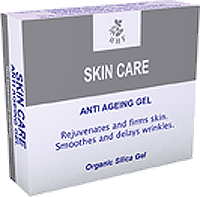 I have been using your Skin Care Anti Ageing Gel and found it very satisfactory. Skin Care Gel is an amazing product. It has strengthened my skin and erased fine lines; it now feels firm and looks radiant. Before I started to use the gel my skin lacked vibrancy and appeared to be ageing, it was dry and slightly lined. After only two weeks of using the product I had noticed a difference to the quality of my skin – it was remarkable. I initially realised that there was an increased hydration and it was actually becoming healthier - it was softer and supple. Skin Care Gel feels light on application and has a smooth and delicate texture, clean, natural fragrance. The gel’s organic Silica ingredient leaves my skin feeling completely rejuvenated. My skin has remained radiant and feels firmer after using two pots of Skin Care Gel. The fine lines on my face have smoothed out and almost disappeared. It now feels protected against environmental stress and feels years younger. I can confidently say that as a pharmacist I would recommend Skin Care Gel to customers who are concerned with skin ageing.